During the course of three days, innovators in industry and academia shared their expertise at the COMSOL Conference 2016 Boston. Our users — you! — are very passionate people, and it’s wonderful to see this passion firsthand during the user presentations and poster sessions each year. On the final day of the conference, we gathered to celebrate this year’s Best Paper and Best Poster award winners. Choosing winners from an impressive collection of projects was not an easy task and we appreciate everyone’s contributions. The COMSOL Conference 2016 Boston Best Paper and Best Poster award winners and Svante Littmarck, who handed over the awards. From left to right: Svante Littmarck, Andrey Morozov, Chenhui Zhao, Bryan Adomanis, J. S. Karthikeyan, Jordan Chase, Fulya Akpinar, and Elizabeth Ledwosinska. Our first Best Paper award went to Bryan Adomanis et al. from the Air Force Institute of Technology and Sandia National Laboratories for their paper titled “COMSOL Multiphysics® Software As A Metasurfaces Design Tool For Plasmonic-Based Flat Lenses“. This group’s research revolves around metasurfaces, which can be used to help flat lenses achieve precise control of a phase gradient across an interface. Previous research on this topic focused on designs with simple geometries, since modeling more complicated geometries is difficult. With COMSOL Multiphysics and the Wave Optics Module, the researchers could prepare to move on to more complicated designs by creating and optimizing a few simple plasmonics-based flat lens designs. Through their studies, the researchers discovered that their novel metasurface can help focus infrared light across a single flat surface during the initial flat lens design stages. Their studies were also validated against experimental results. Chenhui Zhao and M. G. Prasad from the Stevens Institute of Technology received the second Best Paper award for their work titled “Studies of Sound Radiation from Beams with Acoustic Black Holes“. When designing machine systems, engineers must pay close attention to unwanted vibration and noise. To account for and control this issue, engineers can use solutions such as acoustic black holes (ABHs), which passively modify structures, gradually reducing the wave velocity until it hits zero. Additionally, due to the progressive wavelength reduction, vibration energy is concentrated at the ABHs. For their project, these researchers used COMSOL Multiphysics to investigate how the geometry of ABHs affect a cantilever beam’s sound and vibrations. 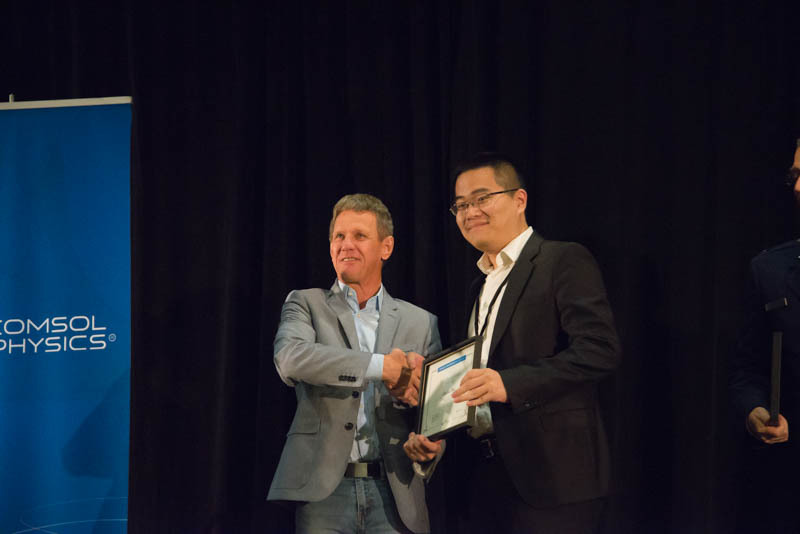 Svante Littmarck, CEO of COMSOL, Inc., presents a Best Paper award to Chenhui Zhao. 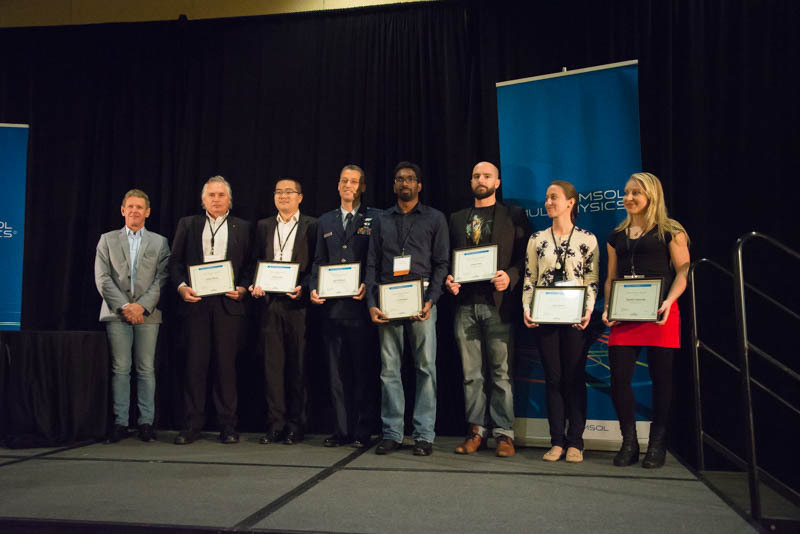 The final Best Paper award was given to Andrey Morozov of Teledyne Technologies, Inc. for the paper titled “Simulation and Testing of a Tunable Organ Pipe for Ocean Acoustic Tomography“. This paper addresses ocean acoustic tomography, which needs to cover a broad frequency band with low-frequency signals when used for long-range applications. One system that achieves this uses a tunable narrow-band and high-efficiency sound resonator design that was developed by Teledyne Webb Research. For his paper, Morozov used COMSOL Multiphysics to analyze a new high-Q resonant organ pipe that has an octal band of 500 to 1000 Hz. With simulation, he could successfully visualize the structural acoustics of this tunable resonator. Morozov was also able to validate his results against experiments and saw that the parameters for the sound source and the COMSOL Multiphysics simulations were close. We presented the first Best Poster award to Elizabeth Ledwosinska and J. Gammel of Silicon Labs for their work entitled “A Field Simulator for Permanent Magnet Applications“. 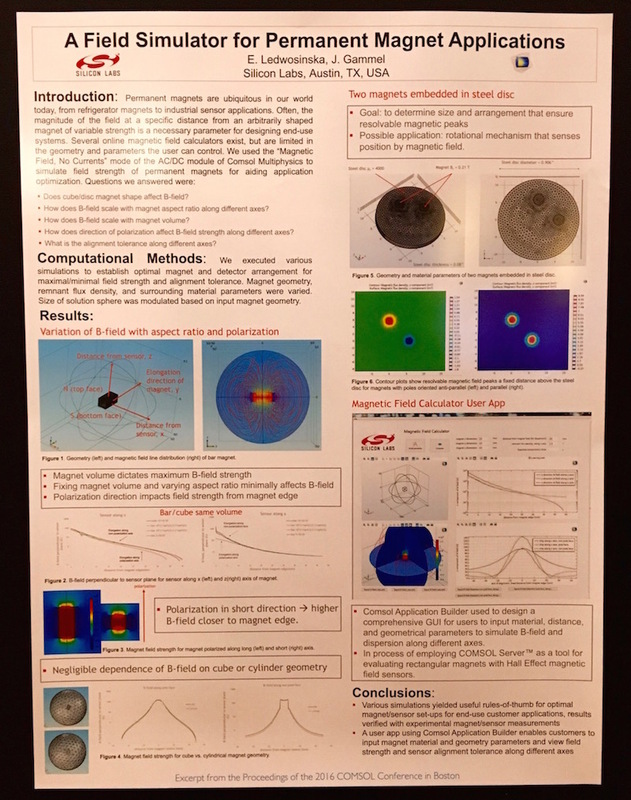 This poster focuses on permanent magnets, which have uses ranging from the magnets we put on refrigerators to industrial sensors. To better design end-use systems for such magnets, engineers need to accurately study the field magnitude at a certain distance from a magnet with an arbitrary shape and variable strength. This team turned to the Magnetic Field, No Currents interface in the AC/DC Module to simulate the field strength of permanent magnets. Further, two magnets in a steel disc were modeled to study arrangement and size and to confirm resolvable magnetic peaks. Furthermore, the researchers used the Application Builder to create a simplified user interface to study the B-field and dispersion at different axes. In the future, the team plans to extend their research with the COMSOL Server™ app-management and deployment software. Fulya Akpinar et al. 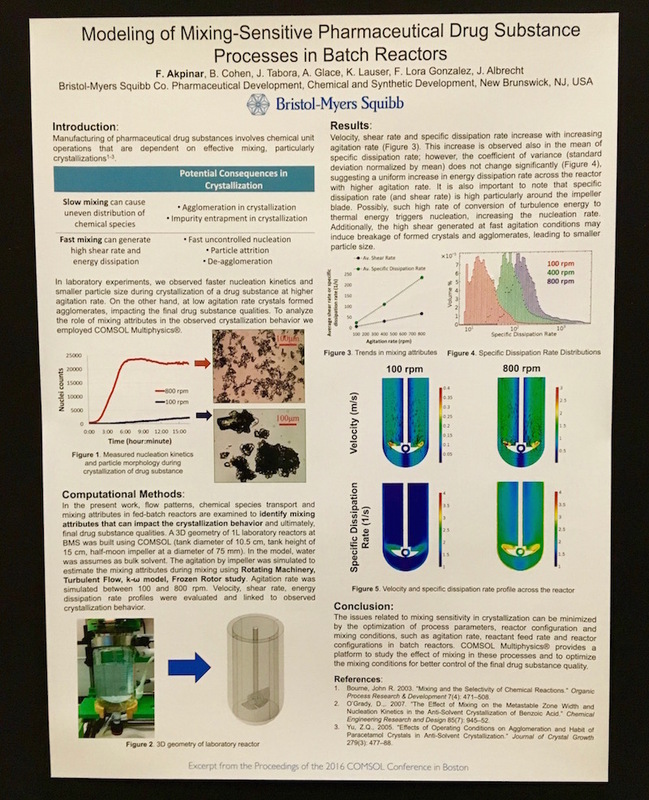 from Bristol-Meyers Squibb were given a Best Poster award for their poster titled “Modeling of Mixing-Sensitive Pharmaceutical Drug Substance Processes in Batch Reactors“. An important goal in the pharmaceutical industry is to effectively mix drug substances, while paying close attention to reactions and crystallizations in the chemical unit operations. During the manufacturing process, nonoptimal mixing can cause the chemical species to be unevenly dispersed in the stirred tanks. This, in turn, may cause impurities to form and a reduction in the selectivity during the reactions. Further issues include impurity entrapment and uncontrolled nucleation. Fortunately, optimizing the reactor’s configuration, process parameters, and conditions for mixing can help reduce these problems. The team used the Rotating Machinery, Reactive Flow interface to identify critical geometrical components and process parameters affecting the mixing process. Their objective? To optimize the mixing conditions and increase the quality of the final drug substance. Jordan Chase from Alphabet Energy, Inc. received a Best Poster award for his work titled “Optimization of a Thermoelectric Conversion System“. Thermoelectric materials offer a theoretical benefit of having unlimited heat-to-electrical-power conversion efficiency. Despite this, thermoelectric materials still have a few obstacles to overcome before they can become competitive. 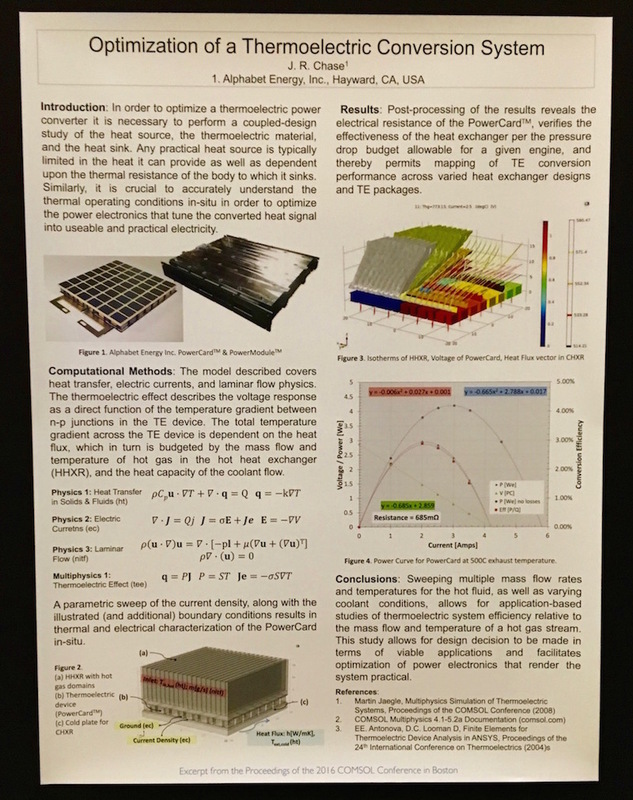 Engineers are looking to increase the practical usability of thermoelectric materials, including when they are exposed to realistic sources of waste heat and service environments. To accomplish this, Chase combined the power of COMSOL Multiphysics® and SOLIDWORKS® software to design and optimize a thermoelectric device. Chase’s device is able to operate at hot-side and cold-side temperatures of up to 350°C and 50°C to 150°C , respectively. In laboratory tests, the device has successfully sustained these temperatures for hundreds of hours. Chase also wanted to reduce the residual thermal stresses and strains. To do so, he studied the device’s fabrication process using a thermomechanical stress analysis. Similar to other award winners at the COMSOL Conference 2016 Boston, this project was validated against physical experiments. 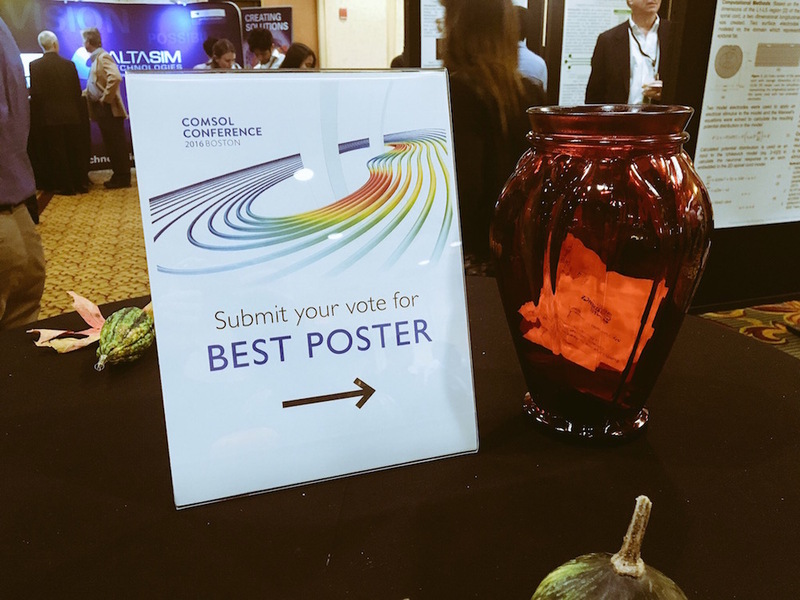 During the poster session, conference attendees submitted their votes for their favorite poster. Ultimately, the Popular Choice Best Poster award went to J. S. Karthikeyan et al. from Rutgers University for their poster “Effect Of Viscosity Of Food On Digestion And Nutrient Absorption In The Human Small Intestine“. 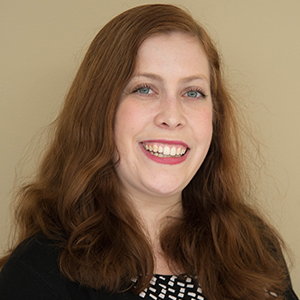 This poster focuses on an important area of research that has uses in both the food and health industries: food digestion and nutrient absorption. Previous research into the human digestive process has used in vivo feeding studies, however, this method is expensive and lengthy. Instead, this research team decided to use multiphysics simulation to help improve gastrointestinal research and better analyze the dynamics of food in the human small intestine. As a first step toward achieving their goal, the team built a fluid flow model involving a small intestine geometry and intestinal mobility, and included both diffusion and reaction physics. Their hypothesis was that the small intestine’s food and nutrient digestion rate is inversely proportional to the viscosity of the food. Looking forward, they hope to improve their model by expanding their geometry to include the entire small intestine and multiple peristaltic waves, as well as by studying the transport of diluted species. They also want to validate their model against experimental results. We would like to thank all of you who presented your innovative work at the COMSOL Conference 2016 Boston. And once again, congratulations to the seven award winners. It was a pleasure to learn from all of you! Want to access all of the user presentations and posters from the COMSOL Conference 2016 Boston? We’re working on it — stay tuned!